I first ate Norwegian soup when I went to Warsaw to apply for Canadian visitor visa. After a long travel by train, short night at the hotel, and hours spent in the line to the embassy (I joined the line at 4:00 in the morning to have my interview only a little before 11:00), I dreamed about something comforting to eat. On the way back from the embassy, I stopped at a small café at the Warsaw train station and tried this wonderful soup there. I have no idea if it's really Norwegian recipe or if it’s called this way only cause we use Norwegian salmon here, but no matter from which country the recipe comes from, it's absolutely marvelous!!! 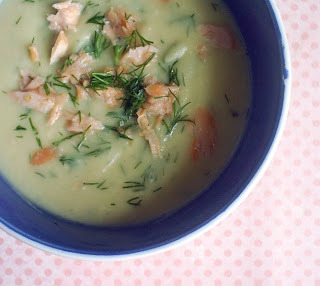 The salmon goes perfect with fragrant dill and the potatoes provide the soup with wonderful creamy consistency. Back home I searched the Internet for salmon soup recipes and I found one very similar to what I had in Warsaw on a Polish site. I’ve made a few changes to the recipe. I changed some amounts to get the right consistency; I used white instead of black pepper, vegetable stock instead of chicken stock, and oil instead of butter. The soup turned out wonderful - thick, creamy, incredibly comforting, and absolutely delicious!!! 1. Heat the olive oil in a large, heavy-bottomed pot over low heat. Add the onions and sauté for 3 minutes (the onions should be tender but not brown). 2. Add potatoes and vegetable stock and simmer for 20-30 minutes or until potatoes are soft. 3. Remove from the heat and puree with a blender until smooth. 4. Return the soup to the pan, add cream and pieces of salmon. Reheat gently. 5. Season with black or white pepper, nutmeg and horseradish if you like (I use about 1-2 teaspoons). Taste and salt if needed. 6. Serve topped with lots of dill. Wlasnie sprowalam zupy - pyszna, dziekuje za przepis i pozdrawiam! Bardzo się cieszę, że smakowała i również bardzo ciepło pozdrawiam!! !